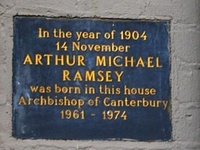 Arthur Michael Ramsey (1904-1988), 100th Archbishop of Canterbury, was born in Cambridge (at Aaron House in Chesterton Road, opposite Jesus Lock) and maintained a close interest in Little Saint Mary's throughout his life, beginning in childhood when his family worshipped next door at Emmanuel Congregational Church (as it then was). He kept up the link throughout his years as undergraduate at Magdalene, as Vicar of our neighbouring parish of St Bene't and as Regius Professor of Divinity in the University. After his consecration to the Episcopate (successively at Durham, York and Canterbury) in 1952, Bishop Michael continued to revisit Cambridge regularly, and preached many times in LSM. The society founded in his memory organises an annual lecture on some aspect of Christianity, which is delivered at LSM in November. The 2019 Michael Ramsey Lecture is planned for Monday 4th November at 5.15pm.